How Do Real Estate Clients See You? Why do they think that way? Probably because so many agents in the past have treated people as inferior, and just a means for them to make a paycheck. So the key for you is to understand this point, and make sure you address it when working with your potential clients. You need to assure them that you are working to find them their dream, and at the best possible price. Or, if you are working for a seller, that you are working to get them the highest possible price on their property. Remove the “you” out of the equation, and focus on the “them”, and you can totally change their perspective of you (and possibly agents in general) all the while getting what you want out of the deal too, THE COMMISSION! I'm looking to take the knowledge I have gained as a professional real estate agent, online marketer and web developer to help you launch a successful business as a real estate agent. However, you'll first need your license before you can get anything going. Use this website as a guide to taking that first step. You can do it! And I am here to support you in that effort. Here's to your success! 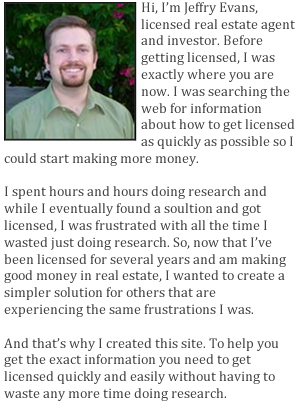 Is It Worth It To Get A Real Estate License?